Glaciers are slowly disappearing all over the world. 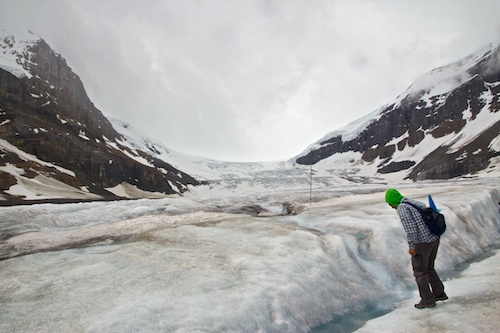 Since we seem unable in the near term to address the warming trends that are causing this problem I figured I’d better take the opportunity to stand on one before they are all gone, and the Columbia Icefields seemed the perfect place to do it. For two weeks we have been working our way north through the rockies. 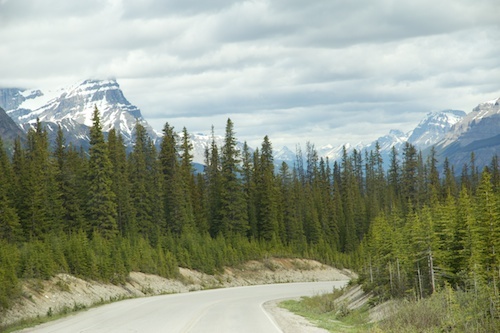 Now, we were leaving Lake Louise in Banff National Park and heading to Jasper at the northern end of the Canadian Rockies, the 140 mile Icefields Parkway is the road that connects the two places. It is a road of majestic mountains, dramatic views and vast bodies of ice. The centerpiece is the massive Columbia Icefield. It is fed by eight glaciers and is about 150 miles square. It is a source of much of the fresh water in North America and is a triple continental divide ( a cup of water poured out will flow north to the Arctic Ocean, east to Hudson Bay and the Atlantic and west to the Pacific.) It is also the place with the most accessible of all glaciers. 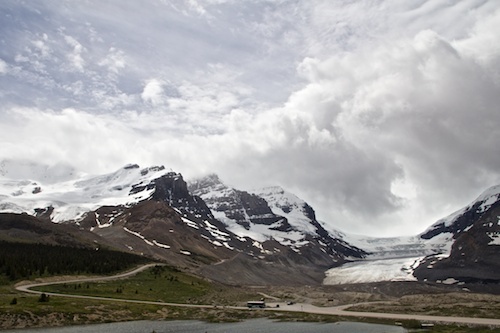 The Icefield Center overlooks the Athabasca and Dome glaciers and offers great views of the mountains surrounding the Icefield (most of its mass is hidden behind these peaks.) Here you can visit the exhibits and learn more than you ever wanted to know about hydrological divides, or hike up to the lower end of the glacier, or, like me opt for the total experience, a 90 minute excursion out onto the mass of the glacier itself. 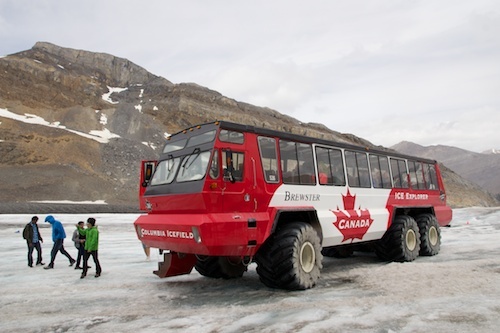 After a short bus ride halfway up the mountain you board these million dollar “ice explorers,” with 5 foot tall tires and the ability to go up and down a 36% grade, and drive right out onto the the glacier and walk around for a while. It was sunny when we left the Center, but out on the glacier you have low clouds, cold, damp drizzle and high winds. All of this combines to make your stay on the ice an endurance test. Trying to take a clear, focused photo while being buffeted about by gale force winds and being pelleted by freezing rain is a challenge. The trade off? I got an up close look at the bright blue coloration glaciers are known for and I can now say I have walked on one. I just hope when my great grand children look at the pictures of a glacier that they are still around and haven’t gone the way of the rotary desk phone. Sounds like a good idea to me. Never knew that there were glaciers of that size in Banff. Nice post! How cool was that! Thanks for the great pictures! You can say you did “walk on water” sorta!!! Oh, my, walking out on the glacier is amazing! What beautiful views from every direction! I would love to do that! I would not mind seeing/walking on another glacier. Great pictures.